What every mother needs to know. First rule of motherhood: Don’t be a bad mom. The phrase “bad mom” sums up every mother’s fears from the time we discover there is a little soul growing inside of us. Fear of being a bad mom fuels the internal voice that makes us constantly feel that being a mother requires the pursuit of some universally acceptable, yet unachievable, self –sacrificing, overly exhaustive list of demands. Bad Mom fear causes the knot in our stomach when cereal is all we can manage for dinner. It is what causes us shame when the woman across the aisle at the grocery store stares a little too long while our children roll around angrily in the floor when we refuse to give them candy. It is what makes us explain to the dentist profusely that we never let them have sugary drinks while he points out cavities, or when we sweat bullets hoping our children don’t tell him that they actually had soda last night. It’s what makes us dodge the PTA president when we missed the last three PTA meetings or why we tell our child’s teacher with a straight face that we have no idea where they heard that “potty language.” For me, most recently, my bad mom fear was in overdrive as my mother described to me how my son, blurted out “Who is Jesus?” when she took him to church with her. Fear of being a bad mom: it is the stuff that nightmares are made of. Second Rule of Motherhood: Be a good Mom. Makes sense, right? The best way to ensure that you are not a bad mom is to be a good one. In our frantic endeavors to hide all of the things that would label us a bad mom, we engulf ourselves and our children in all of the things that deem us a good mom. We become busy trying to find an acceptable balance of perfection for our children to achieve. We want them to be tough but sensitive, proud but humble, nerdy but cool, outgoing but reserved, rule abiding but innovative and all of the things that will earn us our good mom merit badge. We consume ourselves with determining what we need to do to ensure that they become “who they are supposed to be.” The desire to be a good mom drives every demand, expectation and judgment that we put on ourselves, that we allow from others and that we are guilty of projecting onto other mothers. Surely, it is our job to mold and shape our children into successful, well-balanced, contributing members of society. Ironically, by that definition, our job success or failure is not determined by us, but by the achievements (or lack thereof) of our children. In our well-intentioned quest for motherly perfection, we have begun forcing our children to prove our worth. What an impossible burden for them to bear. I have never felt as inadequately equipped to do anything as I did about being a mother. Yet, I quickly mastered the bad mom guilt and the good mom expectations. I also discovered the rarely discussed (but widely known) crazy mom who literally cries over spilled milk and sometimes hides in the closet to eat snacks that she doesn’t want to share. I was caught in the accepted cycle of depending on my children’s adequacies to solidify my own. And then one day my daughter came home crying over a bad test grade. I asked her why it was bothering her so much and she sobbed that she just wanted me to be proud of her. My heart shattered into a million pieces as I hugged her, unable to speak because I was trying to pinpoint the exact moment that I let my child believe that her value had conditions, and even worse; that my love did. That night when she was sleeping, I went into her room, I placed my hand on her heart and whispered; “you are enough.” Those are the words that I wished I had said to her aloud earlier in the day. While I knew that I would say them to her in the morning, I felt the need to immediately speak to her soul. Then I cried myself to sleep after speaking the very same words to my own soul. There are no rules to Motherhood. We become so consumed with the idea that we will fail at our jobs that we don’t take the time to intuitively identify our job description. We are not the designer of their destiny; we are the protector of their soul. Our job is to love them and support them in navigating this world with 100% confidence that they are enough. Everything they need to be, everything they are meant to be and everything that they are supposed to be: They already are and so are you. All that they will ever need is you. Not the “you” that you’ll become when you check off every box on your master list of perfection. The “you” that you already are. Without saying a word, without buying a thing, without doing a thing. Your very presence, the experience of your presence, even the memory of your presence is already enough. A bond so divinely created that it is effortless and without conditions. It is the reason they climb into your bed at night, it is why they must tell you all their hopes and dreams while you sit on the toilet. 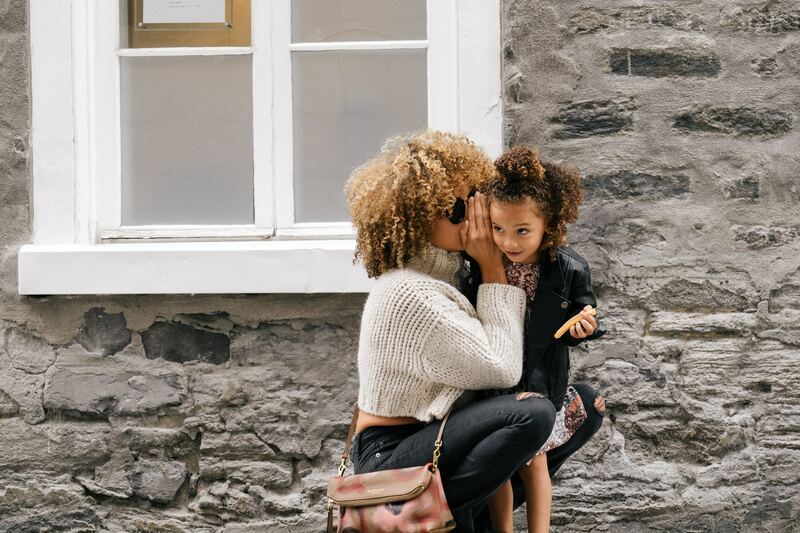 It is why they ask you a million questions with every intention of disputing each of your answers and it is the reason that a kiss from Mommy has been successful in healing even the gravest of ailments. There is nothing that you need to become. You already are. So, to every mother who has deprived herself of the right to laugh when her toddler correctly (and even impressively) strings together a sentence of “potty words,” for the ones who misguidedly stake their worth on the praises or admonishments of others; for the ones who worry that they don’t have what it takes to hold the title of mother and mostly for the ones who desperately look outward to find all the ways to be a good mom. You already are. You already are. The greatest beauty in this discovery is that once you give yourself permission to just BE, you can empower your child with that same permission.